Just after Kaleidescape brought their DVD server to market, the DVD Copy Control Association (DVD CCA) sued and this lawsuit has been over their and their customer’s heads ever since. No more. The Kaleidescape System copies, bit-for-bit, the entire DVD data to a hard drive for playback. Kaleidescape argued, first successfully in 2007, that this preserved the spirit of the DVD CCA licensing agreement. Being the only server manufacturer to actually possess a DVD CCA license for the Content Scramble System (CSS), Kaleidescape was saved the fate of other competing servers who were sued to oblivion who had not. The DVD CCA argued, successfully on appeal in 2012, that the CSS encryption licensing required the physical disc to be present in the playback device. Kaleidescape was given a permanent injunction, but this ruling was stayed pending appeal. On June 2, 2014, Kaleidescape and the DVD CCA finalized terms of a settlement which requires Kaleidescape to have the physical disc present in the player upon playback effective on servers sold after November 30, 2014. Kaleidescape Systems will then no longer store data on the hard drives and will have to be played from the tray or vault. The same tags will be used so DVDs will start immediately without warnings or trailers, and chapter and scene tags will still be available. Why would Kaleidescape agree to such terms after building their entire business model on the idea of no more discs? Because times are changing, and DVDs aren’t as popular as they once were. Blu-ray Disc is here now, and Kaleidescape does have rights to store the data on hard drives as long as the disc is present in the vault or tray upon playback. More than that, the Kaleidescape Store allows for bit-for-bit downloads of DVD and Blu-ray movies for playback without a disc present – including UltraViolet license. The future is arriving faster than you know, because the Kaleidescape Cinema One is intended mainly as a download device. This settlement is also opening doors to more studios to allow for far more content to be sold through the Kaleidescape Store. This future cut off date may even be a foreboding of new hardware at better price points to push a download service with better features than any other to a larger market. For more information, read this interview with Cheena Srinivasan, CEO of Kaleidescape. The leader in home video library storage, Kaleidescape has just announced their very first mass-market all-in-one movie server. The Cinema One stores up to 600 DVD-quality or 100-Blu-ray quality movies with zero compression to provide the full DVD or BD experience more quickly and easily. Along with DVD and BD storage, the Cinema One is fully integrated with the Kaleidescape Store for full DVD or BD quality downloads. Priced at just under $4,000, the Cinema One offers the Kaleidescape Experience of much more costly server systems in a simple-to-install, easy-to-use package. It is so easy to use Kaleidescape is offering the new Cinema line server direct to the consumer on their website. The existing Kaleidescape System is becoming the Premiere line and will be sold only through electronic system contractors. The Cinema line will not integrate with the Premiere line. Two Cinema One servers can be used in the same network to double the storage and provide a second zone of playback. This is limited to two Cinema One servers. The Kaleidescape Store will allow full downloads of Blu-ray Disc movies, including all bonus content and menus, but physical Blu-ray Discs you may own will have to be in the player while viewing stored content. The integrated BD player can start movies instantly without the FBI warning, previews and ads, just like stored content. The Cinema One can be linked with a Kaleidescape DV700 Disc Vault to allow storage of your BD movies so you don’t have to put it in the player every time you want to watch it. A bundle of a Cinema One server and a DV700 Disc Vault is available for $7,990. The Cinema One uses the same award-winning control interface and commands as the Premiere line, including the iPad app and the Child Remote. Vudu has released the beta for In Home Disc to Digital, allowing conversion of your existing DVD movie collection to UltraViolet digital in the comfort of your own home. Previously the movies had to be taken to Walmart for verification. To get started, log into your Vudu account and click “Disc to Digital” in the menu. (This may not be available to everyone at this time as it is in beta.) You will be directed to download the VUDU To Go app. Insert your DVD or Blu-ray Disc (if you have a BD-ROM drive) into your computer and verify ownership. Voila! your digital copy appears in your UltraViolet digital lock box. There is an initial offer for $2 off your first conversion. Once you secure digital rights in UltraViolet this title is available on multiple streaming services, not just VUDU, as UltraViolet is an industry standard. Streaming is available on iPad, computer (MAC/PC), Xbox 360, PlayStation 3, Blu-ray Disc players with BD-Live support, and certain network enabled HDTVs. The VUDU To Go app also allows you to download your digital copies for use offline. The studios supporting the UltraViolet digital rights format include: Paramount Home Media Distribution, Sony Pictures Home Entertainment, Twentieth Century Fox Home Entertainment, Universal Studios Home Entertainment, Lionsgate Entertainment and Warner Bros. Home Entertainment. Verizon has just launched Redbox Instant, the new streaming video service aimed at competing with Netflix and Amazon. You know Redbox from their … uh … red boxes outside and inside almost every retail store you’ve visited this week. So what does Redbox Instant offer? First off you can sign up for a free trial which provides a month of free service. The service includes unlimited streaming to web browsers and mobile devices with other consumer electronic support coming soon. But not only is this a streaming service it also comes with four DVD retals at Redbox kiosks every month. After your free trial ends the service costs $8 per month. That is some deal. A similar subscription from Netflix costs twice that amount ($7.99 for streaming and $7.99 for one-DVD-at-a-time by mail = $15.98). The downside is Netflix has been spending a lot of capital to procure titles for many years now so Redbox is behind on that front. Just a brief glace at the offers showed several new releases (like Denzel Washington’s latest Flight) but mainly a lot of title you’ve never heard of before (The Hit List, Dolan’s Cadillac, etc.). It’s a free trial, what can you lose? Streaming is profitable, even unlimited subscription services, while physical disc sales and rentals are falling far behind. Even the convenience of Redbox isn’t keeping pace with streaming services. Near my home there is an empty building bearing the once-ubiquitous name of Blockbuster. Right next door is a Walgreen’s pharmacy with a Redbox kiosk offering two renting terminals. I thought that was a telling example of how Blockbuster has failed. The convenience of picking up a movie almost anywhere just killed off Blockbuster. Yet recently I’ve learned the convenience of renting movies from Amazon Instant Video even surpasses Redbox considering the rentals are nearly the same price, there are no penalties for returning the movie late, and you don’t even have to leave the house. Pairing Netflix with Amazon Prime and Amazon Instant Video means most movies are available quickly, conveniently and cheaply. And it’s not just Amazon; iTunes, Time Warner Cable, Comcast, Dish Network, DirecTV, Vudu, AT&T, Verizon, and other services all provide instant rental services at varying prices which can supplement the subscription services of Netflix and Hulu Plus. I’m not totally over physical media. I love Blu-ray Disc quality, and I prefer to own physical copies of certain movies. I just don’t think every movie is worthy of Blu-ray Disc ownership, and when I’m rushing to pick up my kids from child care right after work, it’s so much easier to just rent the movie once I get home instead of stopping anywhere to pick up a movie, which may already be rented out. Digital streaming is the future, and the faster the content providers can find out how to make it profitable the better. 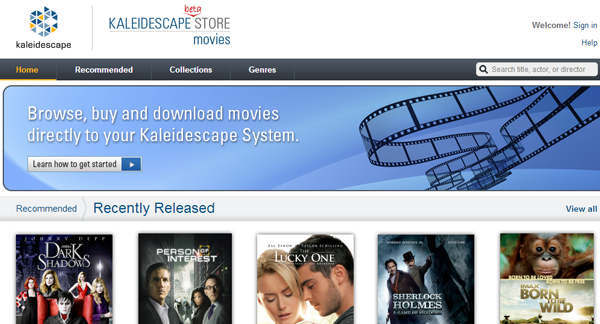 Kaleidescape has launched the beta version of their online retail store for owners of a Kaleidescape System. Backed by a multi-year deal with Warner Bros. Home Entertainment, the store is providing bit-for-bit downloads of DVD and Blu-ray Disc content directly to the Kaleidescape server. Content is continually being added to the storefront, and there will soon be nearly 3,000 feature films and over 8,000 television episodes from Warner Bros. alone. Looking through the titles, you will find impressive collections including the entire Warner catalog of Clint Eastwood directed movies, a laundry list of Stanley Kubrick films, and a whole library of Rotten Tomatoes “Certified Fresh” titles. How the process was described to me by a Kaleidescape representative is that Kaleidescape buys physical copies of the movies for each download and stores them in their own warehouse. This way the copyright license is intact without having to create a new digital version with its own license structure and licensing rights to be negotiated, and the studio gets their “disc” sale. This is also beneficial to the end user who doesn’t have to store the physical discs at home, and the download comes complete with the special features every DVD or BD comes with as well – unlike other digital versions. Obviously this is a hokey legal work around, so hopefully these high-quality, feature-full downloads will be available without the disc ownership issue in the future. Because the data is bit-for-bit identical to the physical disc, the video resolution is not compromised, and the audio remains high-definition surround sound. Additionally, titles with UltraViolet digital copies provide additional digital access from tablets, smartphones, and computers. To make things explicit: This is not a streaming service, but a complete digital download. The files are stored on the local hard drive, and played from the local server to the local player. Once the video is downloaded to the local Kaleidescape System, the full HD video will play immediately with no buffer. The Kaleidescape System features a proprietary RAID hard drive array which prevents data loss, but if there is a catastrophe and the server data is lost, the downloaded titles may be downloaded from Kaleidescape again for no cost. Any titles loaded into the system at home would have to be loaded again from the physical disc. The store will allow the end user to purchase individual titles, or they can select a complete collection to purchase. The store is smart enough to know what movies you already own so you won’t purchase multiple copies. For example: you can purchase a collection called “Academy Award Nominees — Best Picture” to purchase and download the entire listed collection, but if you already own the Lord of the Rings collection, those titles won’t be purchased. One interesting collection is the Leonard Maltin Recommends collection, an exclusive to Kaleidescape partnership of movies selected by famed film critic Leonard Maltin. One feature that isn’t active yet but I’m told will be is the ability to upgrade a DVD copy to a Blu-ray Disc copy. I’m not sure how this would work, and I won’t make any assumptions. The new high-def copy would replace the standard def version, but I’m not sure if the standard def version is completely wiped out or made available through the menu still. Some DVDs have different special features, so some collectors may want to have both. UPDATE: Kaleidescape claims DVDs can be upgraded to Blu-ray Disc for $8 each, to include all bonus features of the BD. This is only available to titles with UltraViolet HD rights. The Kaleidescape System is expensive, but it’s also the best and only solution of its kind. If you have a few bucks and are serious about movies, find out where your local dealer is and ask for an in-home demonstration. The good folks over at Corel sent us over their new Roxio Easy VHS to DVD 3 Plus product to review. Yes, you read that right, Corel now owns Roxio consumer software. This hardware & software combo package allows you to capture and transfer analog video from sources like a VCR or an old camcorder, converting them into a digital video format. There are many reasons for converting old analog video to digital. Doing so allows you to retain video quality, as analog video tapes continually degrade when they are played. They even lose quality when they aren’t used, as aging & environmental factors can cause tape to deteriorate. Converting to digital allows you to preserve these videos without having to worry about the source tape media wilting away and becoming unplayable. Converting video to a digital format also provides you with the flexibility to copy your video to a USB storage device, a DVD, a Blu-ray Disc or upload it to a website such as YouTube, Facebook, Vimeo or countless other streaming video websites. This allows for portability and playback on computers, smartphones, iPods and other modern devices.